I thought I’d take a few minutes to sit down and take you inside the job search of someone who is “career-pivoting” in 2017. I realize there is some small inherent risk in writing about my job search on a blog that I’m promoting to potential employers, but this is not a “woe is me / please hire me” piece. This is more of an update, and a look at the process. I’ve learned a few things about myself over the past two and a half months. First, I may be more of a morning person than I thought. In college, I was always the guy writing papers at 3am and despising any classes that started before 11. But now, in my 30’s, I’m finding that I’m much more productive in the morning. I actually can’t sleep in as late as I used to. And when my wife Ellen leaves for work at 7:30, I’d better be out of bed and ready to start “work.” I’ve learned that I’m simply not as effective when job hunting in the afternoon. My cover letters aren’t as sharp, I lose focus when clicking through job descriptions, and it becomes more of a chore. After breakfast, I work on emails. I have a Google Drive spreadsheet of every job I’ve applied for – and where each stands. I look through LinkedIn, Beyond, Indeed, Ziprecruiter, and more for opportunities. 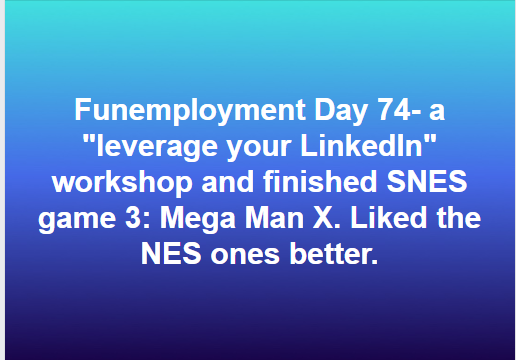 So far I’ve found LinkedIn to be the most beneficial. So I apply, I write cover letters, and try to leverage my network. Networking is a word that scares a lot of people. “How do I network with someone?” Really, it’s as simple as having a conversation. Find one common thread – a career interest, a mutual acquaintance, a hobby (sports is often my go-to). And what I’ve found: there are more people that are willing to help you than you might think. I try to get lunch or coffee at least twice a week with a contact. And if that contact can connect you to one other person, you’re networking. Just be sure to send thank you notes – even a short email is fine. And while some think this is “old school,” I send a handwritten one after a job interview. I’ve really been encouraged by the people coming out of the woodwork to help me out. Some have exceeded expectations – like members of my college radio station’s alumni organization, who have helped me in every step of my career. There are others, however, that really gave me the “warm and fuzzies.” I graduated high school in 1998. Yet thanks to Facebook, I’ve had two classmates (that I’ve seen a combined one time since graduating) reach out to me. Both work at large national companies I’d love to be involved with. Since I’m currently in “throw a bunch of (pasta) at the wall and see what sticks” mode, I’ve also been experimenting with a tactic I came up with on my own. On my personal Facebook page, I’ve been posting “Funemployment Day X” updates. They are brief – and I’m not going to spam my friends by doing it every day. But it serves a couple of purposes. I try to be lighthearted and self-deprecating – enough people complain about their lives and personal drama on Facebook. I learned long ago: If you can’t laugh at yourself, you’re taking life way too seriously. The unintended result of my “Funemployment” updates is that they pop up in different Facebook friends’ feeds from time to time. People see it, and the good-natured ones offer advice, a lead, or a networking contact. Again, the number of “good people” out there has really been inspiring. Middays usually consist of errands and “honey-do” lists. I’m extremely fortunate to have a supportive spouse, who is still working 8-10 hour days. And because marriage is a partnership, it falls to me to take care of all the other things. That includes dishes, laundry, picking up the house, resetting shelving, prepping dinner, and more. I certainly don’t mind – I want to make my contributions to the household. Job hunting is stressful – I had someone tell me yesterday that “if you knew you’d be starting a job in 6 weeks, you could enjoy the time off.” There’s a lot of truth in that – but NOT knowing when you’re going to land something is frightening. I’m a firm believer in needing an outlet to blow off steam. A month ago, I bought a “new” retro Super Nintendo Entertainment system. And for an hour or so in the afternoon, I give myself a mental break and escape to my 12 year old brain. The system came with a few dozen games – so far I’ve made it through Super Mario World, Legend of Zelda Link to the Past, Mega Man X, and now Super Metroid. I’m proud to say I’ve been able to do this with minimal Googling. Now, if I were losing 4 hours a day to this habit, we’d have a problem (starting with a very unhappy wife). But allowing myself a “release” in the afternoon has been important to my mental state. I also need to mention an invaluable resource – Michigan Works. You’re required to register with them to collect unemployment benefits, and the office in Troy has been phenomenal. All of their resources are free. I’ve met with a career counselor, and I’ve taken classes on career changing, leveraging your LinkedIn, and Rock Your Next Job Interview. I have stacks of notes, and the information has been incredibly helpful. Also important to my sanity – working part time. In May (before I lost my full time gig), I became a bar trivia host for Quizzo Detroit. Every Wednesday I host a two hour trivia night at Floodz in Clinton Township from 7-9, and on Thursdays I’m at Avery’s in Rochester Hills from 9-11. This gets me out among people, and also fulfills my jones to speak into a microphone. I think the joy I got out of being a nightclub host in my 20’s is filled by being in pubs and restaurants in my 30’s. I’m also getting involved in the world of podcasting. One of the reasons I’m moving on from traditional radio is that it’s incredibly hard to grow in an industry that’s shrinking by the day. But I still love the craft of writing and communicating a message. So for now, I’m producing the Spiro Avenue podcast about Detroit Sports, and I’m getting involved with another podcast surrounding the happenings of America’s great comeback city, Detroit. Michigan. At my core, I’m a communicator. I enjoy writing, and I have a passion for crafting messaging across multiple channels. I feel my 15 years of media experience has provided me with a skill set that includes writing, communicating, operations, analytics, management, social media, and so much more. Now, the goal is to find an employer who can see how those skills translate. If you know anyone, feel free to send them my way.